Three Asheville businessmen-Robert Pulliam, Ephraim Clayton, and George Whitson-established the Asheville Armory in 1862. By November of that year, they were employing 107 workers and had produced 200 rifles. But the rifles were of poor quality, and Josiah Gorgas, chief of ordnance for the Confederate army, seized control of the works. He dispatched Capt. Benjamin Sloan from the Tredegar Works outside of Richmond, Va., to take over the armory's operations. Sloan was unable to significantly improve production despite a workforce that grew to approximately 125 by January 1863. The increased number of workers, however, was offset by a high level of turnover among the personnel. Consequently, many workers failed to gain the expertise and experience essential for learning the complex production process. Sloan soon resorted to using enslaved African American workers, who were prohibited from leaving the premises and were accustomed to skilled work. Even with more reliable labor, however, arms production did not improve, in part because of raids by native Unionists and the Federal army located in Knoxville, Tenn.
An angry Gorgas replaced Sloan with Capt. C. C. McPhail, a stern disciplinarian. 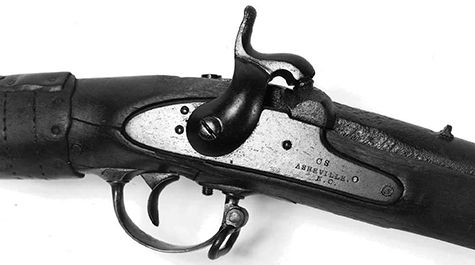 Before McPhail's arrival had any significant impact, Federal raids intensified and the decision was made to transfer the armory equipment to Columbia, S.C. Only 900 rifles were ever manufactured at the Asheville works, and extant examples are rare. William B. Floyd, "The Asheville Armory and Rifle," Bulletin of the American Society of Arms Collectors 44 (1981). Gordon B. McKinney, "Premature Industrialization in Appalachia: The Asheville Armory, 1862-1863," in Kenneth W. Noe and Shannon H. Wilson, eds., The Civil War in Appalachia: Collected Essays (1997). "Confederate Armory." North Carolina Highway Historical Marker Program. http://www.ncmarkers.com/Markers.aspx?sp=Markers&k=Markers&sv=P-57 (accessed November 8, 2012). McKinney, Gordon B. “Premature Industrialization in Appalachia: The Asheville Armory, 1862-1863.” The Civil War in Appalachia. Knoxville: University of Tennessee Press, 1997. p.227-241. http://books.google.com/books?id=3lcmYWnvIDMC&lpg=PP1&pg=PA227#v=onepage&q&f=false (accessed November 8, 2012). "Musket, Rifle. Accession #: H.1963.49.1." 1862-1863. North Carolina Museum of History.